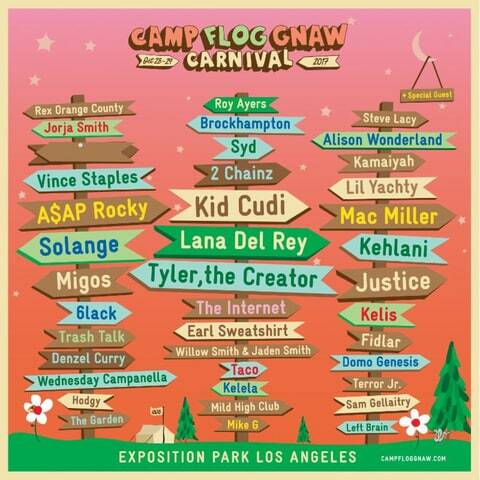 Tyler, the Creator recruited Lana Del Rey, Kid Cudi, Solange, A$AP Rocky, 2 Chainz, Vince Staples and Willow & Jaden Smith for his sixth annual festival-carnival Camp Flog Gnaw, set for October 28th and 29th at Los Angeles’ Exposition Park. Kehlani, Migos, the Internet, Lil Yachty, Justice, Earl Sweatshirt, Kelela, Mac Miller, Taco, Domo Genesis, Fidlar and Kelis will also perform at the event, among others. Tickets go on sale Thursday, August 17th at 3 p.m. ET. General admission weekend passes are $208, with VIP weekend passes at $368. VIP tickets include a dedicated entrance, access to an exclusive VIP clubhouse and special food vendors, a main stage viewing area and a merch package. The festival, which also features carnival games, is also offering a $65 unlimited game day pass. The 2016 edition of Camp Flog Gnaw featured headliners Tyler, the Creator, A$AP Rocky, Lil Wayne, Erykah Badu, Chance the Rapper and Schoolboy Q. Last month on The Late Show, Tyler, the Creator promoted Flower Boy with a Soul Train-inspired performance of “911.” His new docu-series, Nuts and Bolts, recently premiered on Viceland.